WWII BOFIC (Cyrenaica) M.E.F., registered (label) censored airmail envelope to Saisbury, Southern Rhodesia, bs 19/1/44 franked 1943 MEF set to 2/6d (9 vals) canc 'BENGHAZI/30.11.43/AIR MAIL" cds. 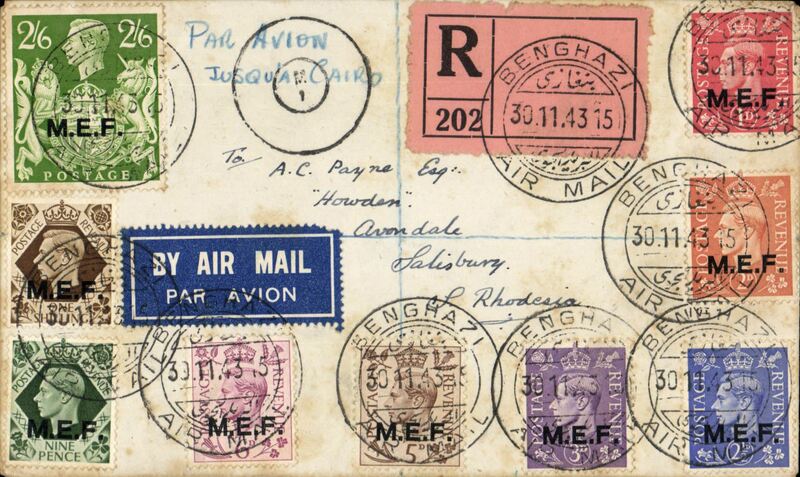 ms "PAR AVION jusqu'a CAIRO" in blue pencil, black Egyptian 'M/1' in a circle censor. In May 1943, at the end of the Desert War, Libya was placed under British (former Tripolitania and Cyrenaica) and French (former Fezzan) control. A philatelic envelope certified empty for purpose of censorship.